These easy-to-care-for plants feature attractive leaves in many varieties and are great for adding color to your house or garden dark corners. As their name implies, Coleus plants are very gorgeous with their leave colors; they can be grown either outdoors and indoors and are too stunning not to notice. Let's dive into this plant. When you first plant your Coleus, whether it be in a container pot or directly into the ground, give it a good soaking of water to saturate the soil. For waterings following this, only water once the soil has started to go dry. Aim to keep the soil moist but not wet, avoiding watering too heavily, as the plant is susceptible to root rot. 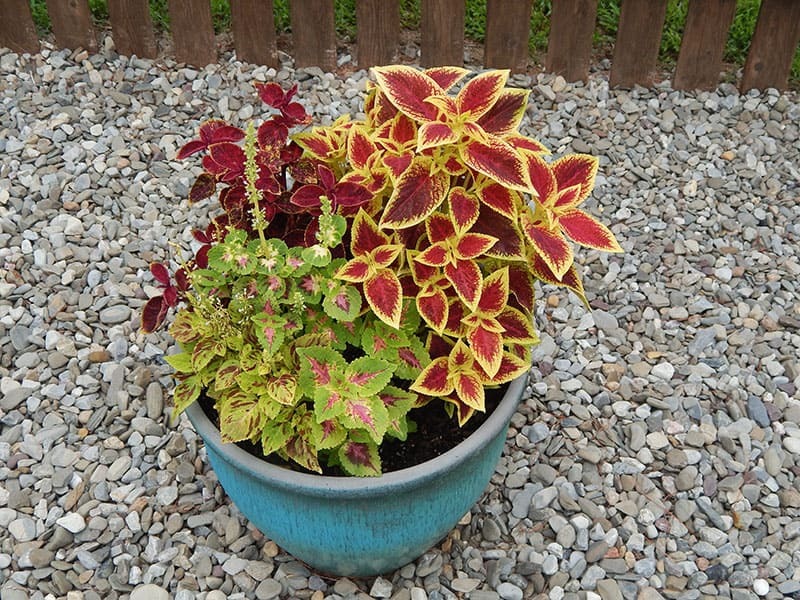 Coleus plants in containers will need more frequent watering than those grown in the ground. During hot and dry summer months, Coleus container plants will need watering at least once a day, sometimes twice. However, always be careful not to overwater, as too much water will destroy the roots and leave the plant unable to absorb any water or nutrients. The Coleus plant loves the shade, making it an ideal plant for bringing some bright and vibrant color to darker corners of your garden. 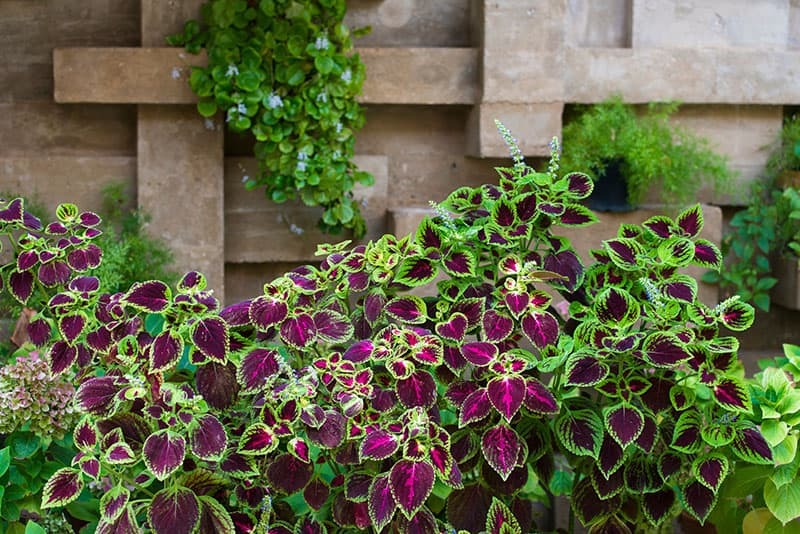 This plant would have lots of shade in its natural tropical habitat, where tall trees would protect it from the sun, so try to replicate this at home by providing the Coleus with ample protection from the sun's harsh rays. Bright, direct light will scorch the leaves, causing the vibrant colors to fade or become bleached, or resulting in browned edges or transparent patches. The ideal spot for this plant is one that gets morning sun and afternoon shade. This is because the sun is much stronger in the afternoon and will cause damage to the plant, so it’s best for it to be in the protection of the shade during this time. Allowing the plant to get some natural light but giving it shade during the heat of the day will result in the best color on the foliage of the plant. If you don’t have an appropriate spot with afternoon shade, there are some Coleus varieties that can tolerate afternoon sun, but be sure to research your variety before you buy it and ensure you have an ideal area for it to thrive. This tropical plant likes it hot, with an ideal temperature range of 70 to 100° F. It can tolerate very warm weather, but the same cannot be said of the cold. When overnight temperatures drop to below 50° F, the Coleus plant can run into trouble. If you have grown your Coleus in a container pot, then the ideal scenario would be to bring it inside when the colder weather sets in, putting it in a warm place with bright but indirect light. It can return outside once the weather warms up in the spring, and temperatures consistently exceed 50° F.
This plant can tolerate high humidity, as it would ordinarily experience this in its natural tropical habitat. 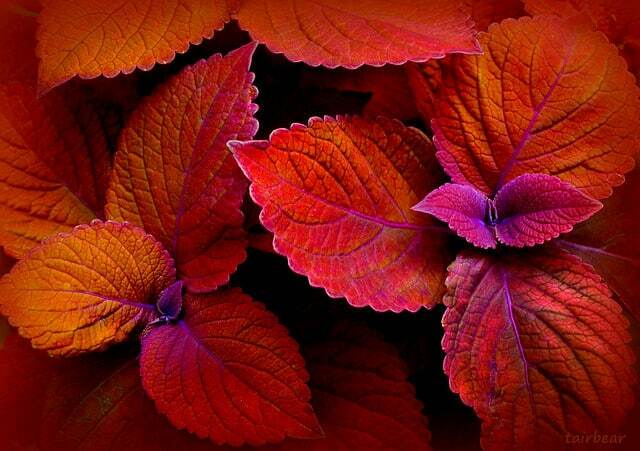 However, the Coleus does not rely on high humidity to thrive and will do just fine in average humidity levels. If you are growing your Coleus in a container pot, then a time will come when it outgrows the space and needs to be repotted in a larger container. A root-bound plant will stop growing, so if you want to your Coleus at its current size, then you can keep it in its pot for an extended period, but eventually, its health will suffer, and you will need to give it more space to spread out its roots. To repot the plant, gently pull it out of its current pot and remove as much of the soil as you can without harming the roots. If the plant was particularly pot bound, then you can gently massage the roots between your fingers to encourage them to spread out in the new pot and continue healthy growth. Select a new container that is around two inches in height and diameter larger than the previous pot, and put enough potting soil in the bottom so that the plant will be at the same level in the pot as it was before. Gently place the plant into the center of the container and fill the edges with new soil. 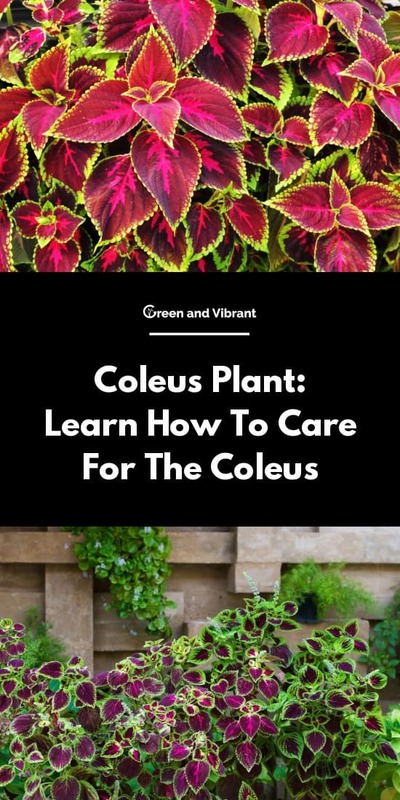 Coleus plants prefer well-draining soil to help prevent overwatering and root rot. Use a mixture that contains plenty of perlite, which will help to ensure the soil drains well as well as aerating it. Once you have completed repotting the plant, give it a heavy watering and then, continue care as normal. 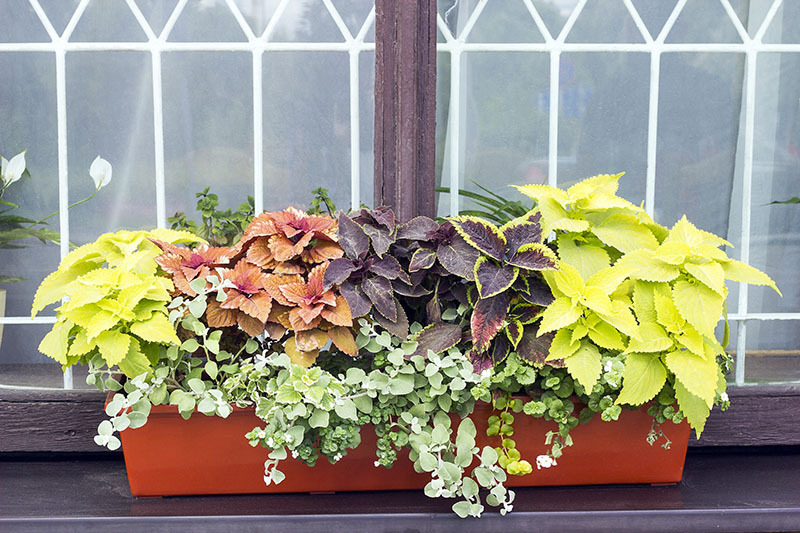 The best time to repot your Coleus is in early spring, and as a moisture-loving plant, you may want to think carefully about the construction of the container you are using. Terracotta pots have a tendency to absorb moisture, so if you’re using a pot such as this, then you should line it with plastic wrap so that the moisture is retained by the soil. Coleus plants kept in containers can be fed a liquid fertilizer once a month throughout spring and summer. It isn’t necessary to feed the plants during fall and winter, as this is a period of minimal growth. If your Coleus plants are growing in the ground, then a slow release fertilizer may be a good option. To encourage abundant leaf growth and vibrant foliage, choose a fertilizer which has high levels of nitrogen. This plant has a habit of becoming quite leggy. To encourage a fuller growth in a bushy style, you can prune the bottom stems of the plant. Snip off spindly stems with sharp shears, ideally a short distance above a leaf node. This should result in the stem forking out at the cut point, creating a denser plant. You can also prune the plant to keep it looking neat or to prevent it from overgrowing, though this isn’t essential. Flowers will appear on the plant in the summer, but they pale in comparison to the beauty of the brightly colored foliage, so it is best to remove the flowers at the stem as soon as you notice buds appearing (Horticulture Magazine). The flowers do very little visually for the plant, and the energy that is spent producing the flowers means that energy is taken from elsewhere. By removing the flower buds in their infancy, the plant will redirect its energy to the continued production of colorful foliage. The Coleus plant can easily be propagated with stem cuttings, or from seed (University of Florida- Gardening Solutions). To grow a new Coleus, take a stem cutting from the mother plant of around five inches in length. The cut should be made just below a leaf node, and you can then remove all of the leaves from the stem except for the top pair. At this point, if you wish, you can dip the cut end in rooting hormone. This can help to encourage root growth, though it is really down to personal preference and isn’t essential to successful propagation. You can propagate your stem cutting in water or in potting soil, and both work equally well. To propagate in water, simply place your stem cutting in a glass or jar, with enough water in so that the bottom half of the stem is submerged in water. Keep the cutting warm, ideally providing warmth from the bottom, and refresh the water when necessary to ensure it remains clean. Within several weeks, you should start to see roots appear from the bottom of the stem. When this happens, you can pot the plant into a small container and continue usual care, or plant it directly into a garden bed. If you are propagating in soil, you will follow a similar pattern, but using a small container of potting mix or propagation medium instead of a jar of water. Use your little finger or the end of a pencil to make a hole in the soil in which to place your stem cutting. Push the soil up around the planted stem to help if stand up, and then, supply the cutting with warmth while maintaining a moist but not wet soil. When you notice new growth on the upper part of the cutting, it means that root growth is also happening. To check root growth, you can very gently tug on the stem cutting, and if you feel some resistance, then it means sufficient roots have formed. If the cutting is easily pulled from the soil, then it means roots are not present or are not advanced enough to repot. Once the cutting is ready, you can plant it up in a longer term home and continue usual Coleus care. Growing Coleus plants from seed is also an easy process and generally results in success. The simplest method is to use a seedling tray full of potting soil and evenly spread seeds across it. Add another layer of potting soil on top so that the seeds are no longer visible. Put the tray in a bright and warm place such as a sunny windowsill, or a sunroom or conservatory, and maintain moist but not wet soil. Using a clear plastic covering over the tray can also be added, which will help to increase humidity and help the seedlings grow. You can expect to see seedlings emerge through the soil in around two weeks’ time. If you used a plastic cover, you can remove it at this point, but continue to allow the seedlings to grow until they start to become too large for their container. When watering the seedlings, add water to the bottom tray so that the roots can absorb it from underneath; this serves to protect the growing seedlings, which are not yet very strong. Once big enough, you can transplant them to a garden bed or planter. The Coleus plant has a seemingly endless amount of varieties and cultivars to its name. Most are vibrantly colored and easy to care for, though some have slightly different growing requirements. Typically, most varieties enjoy a mix of plentiful shade and bright light, though some cultivars have now been developed that can withstand all-day sun (Home and Garden Information Center). Some of the many varieties available are listed below. These Coleus plants are aptly named after the hand and foot-like appearance of the leaves. They usually have green outer edges that appear to be an outline of the dark red interior. While the Inky Toes plant has leaves which are reminiscent of duck feet, the Inky Fingers plant has a wider spread on the rounded bumps of the leaf edges, giving it more of an impression of a hand shape. These popular varieties are often used as container plants, as they fare exceptionally well in pots. This is one variety of Coleus that doesn’t feature unusual coloring. The vivid green leaves have a dainty shape which gives a graceful look to the plant. 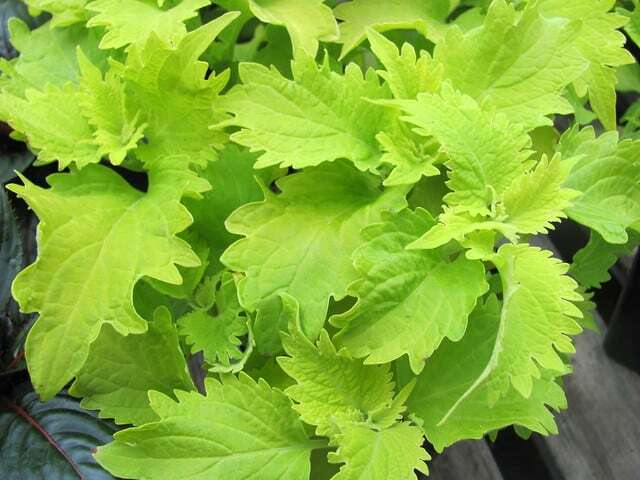 The Wasabi variety is popular to mix with other types of Coleus, as the plain green foliage offsets nicely against more intense colored varieties. This fun variety has semi-circular-shaped leaves that are outlined in green with a striking red center. Each individual leaf looks like a slice of watermelon; hence its name. A rapidly growing and vibrant plant, this Coleus would liven up any dull corners of your garden. If you love the autumnal colors of fall leaves and wish you could have them all year round, then this is the Coleus for you. It has deep orange foliage in an elegant leaf shape, which is sometimes outlined in a thin, darker orange or red edging, or veining. 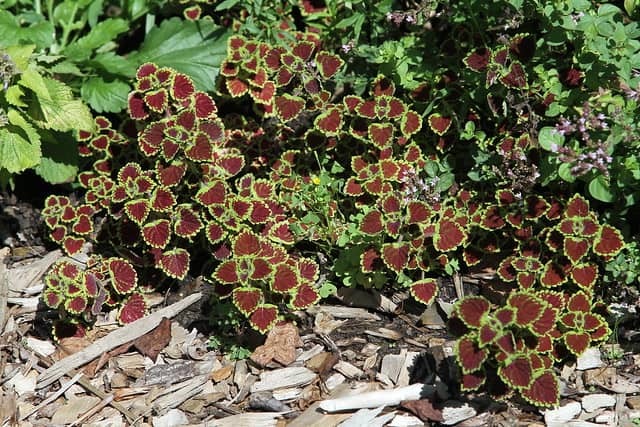 This Coleus plant has rich brown leaves with a bright green edging. The outer edge of the leaves is an interesting zigzag shape, which is further illuminated by the contrasting colors. 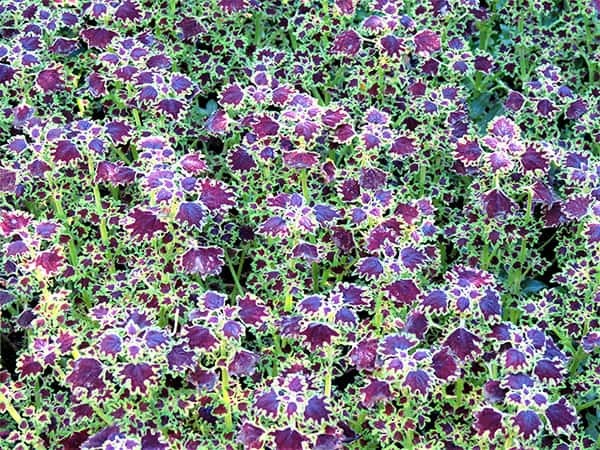 This plant sporadically blooms blue flowers throughout the year, but they are uninteresting compared to the plant's foliage, and like most Coleus plants, it is recommended that the flowers be removed to preserve energy for leaf production and growth. 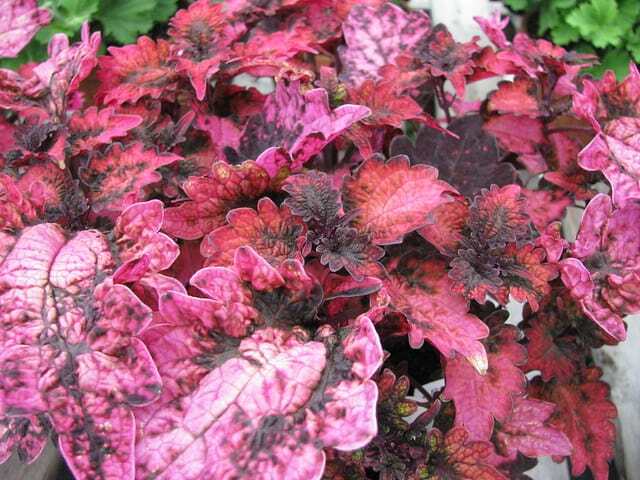 This Coleus variety has pink leaves in shades which are very unusual for plant foliage. The base color of the leaves varies from pale to bright pink, while the central part of the leaf is a very deep purple that almost looks black from a distance. This versatile variety can be either a trailing plant or an upright grower, making it suitable for a variety of different uses in the garden. The colors of the foliage on this Coleus are so vivid and unusual that it is often the prized possession of a gardener, being used as a centerpiece in the garden. The leaves have a very rich texture that is almost like velvet. Added to this unusual texture is the vivid red and burgundy coloring on the leaves, and the result is a very sultry and dramatic looking plant. The leaf shape is also somewhat uncommon, with the frilly edge of the leaves giving the appearance that it could almost be made from fabric. This variety is incredibly easy to grow and care for and looks striking when placed alongside paler colored plants. This variety of Coleus has long and triangular-shaped leaves that reach a sharp point at the end. There is an equal balance in color of green on the outer edge of the leaves and a buttery yellow color on the central part of the leaves. 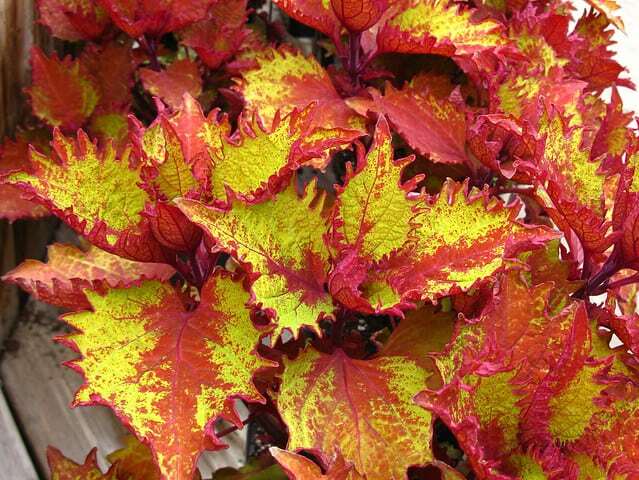 This is another variety of Coleus that features autumnal shades. The leaves are predominantly yellow with red edging and some red speckling on the main part of the leaf. The spiked shape of the foliage is also reminiscent of common autumnal fallen leaves. This popular variety of Coleus has large leaves featuring shades of yellow, green, and pink. The base color is a creamy colored yellow, with green segments in a feathered pattern. The leaf stems, as well as the leaf edges and veins, are a bright pink, which offers a stark contrast against the pale yellow and vivid green. 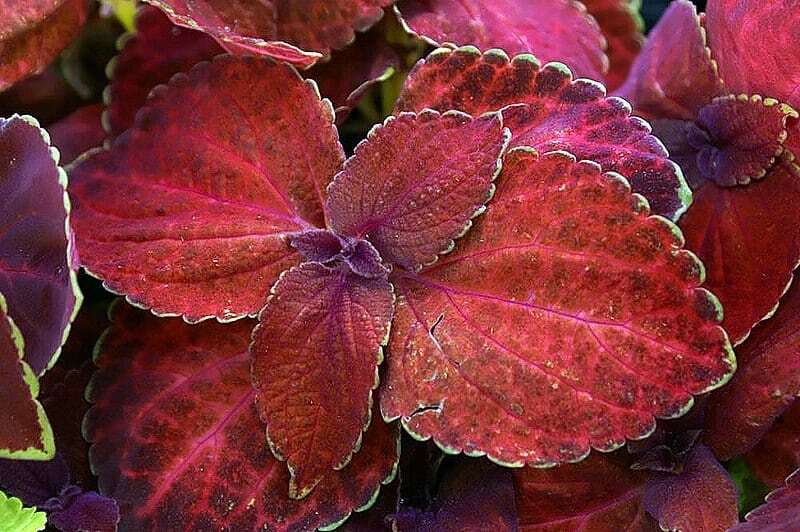 With the impressive array of colors on the unusual frilly edges leaves, it’s not hard to see why this variety has long been a favorite among the Coleus plants. 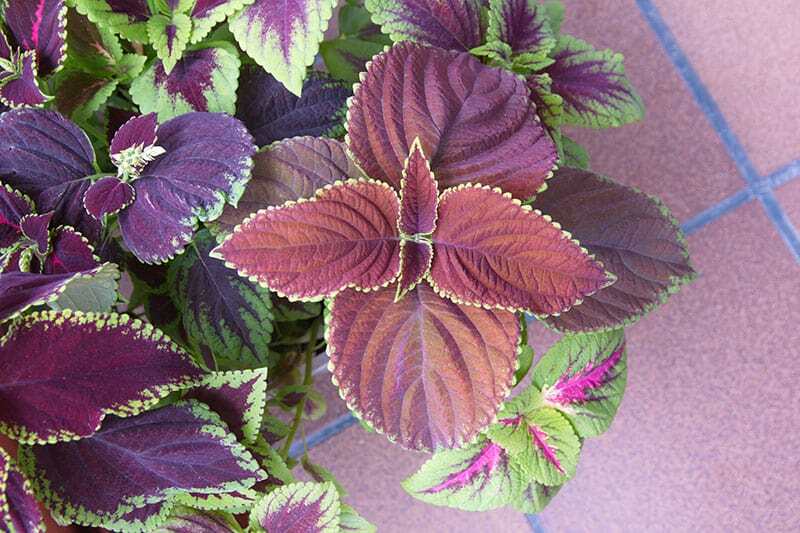 This cultivar series of Coleus plant includes several varieties that are all quite similar in appearance. The ‘Volcano’ and ‘Red Velvet’ varieties both have leaves which are mostly a bright red color with shocking pink veining, which is then contrasted with a very thin green or yellow outline. The ‘Festive Dance’ is another variety within this cultivar, which has the same red and green leaf pattern but also features magenta or orange detailing on the main bulk of the leaf. Another attractive feature of these cultivars is the texture of the leaves, which are soft to the touch. This is another series of cultivars that feature several similarly styled plants with slight color variations. The general color pattern is a thick green edging that transforms inwards into shades of red and pink. Popular varieties of this cultivar are Kong Lime Sprite, Kong Rose, and Kong Scarlet, which all feature various color variations. Do you have a Coleus? Let us know how it’s doing!